For those of you lamenting the demise of the charming little Naga eatery that shut its doors late last year at Delhi's Hauz Khas Village, Dzükou Tribal Kitchen is back. Housed in a back alley of the tony neighbourhood, Dzükou had, arguably, the best view. If you've ever relished their delectable Naga pork ribs, sighing at the glorious sight of the sun going down on the Hauz-I-Alai while birds hurried by to their nests, you'd agree. Just so that you don't buy into a misreading: Dzükou is now no longer at Hauz Khas Village. It has moved a few doors away to the Hauz Khas Main market, which along with the neighbouring Safdarjung Development Area (SDA) community market, has been the biggest beneficiaries of the exodus of good eating joints from Hauz Khas Village. The decor has changed a bit: interior designer Mukul Sood was roped in to do up the place. The result is a very traditional Naga ambience, with contemporary, minimalist chic. There is a six-seater and five eight-seaters, with the provision for Naga shawl blinds to accommodate more guests. There is a small fountain, where water spews from burnished bamboo, and the ceiling is dhokuwa, sourced from Assam, a traditional bamboo weave used as fences in village homes. 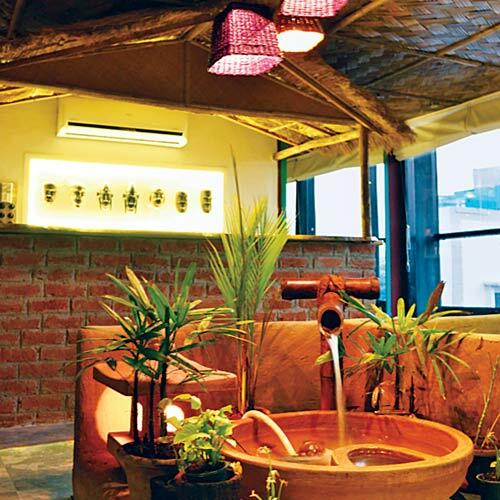 The façade of a Naga hut stands in one corner of the room to serve as a bar that is still to open – the liquor licence is due soon. And there's a space for buffets, which owner Karen Yopthomi informs me, will also start shortly. Dzükou will also host musicians from the northeast, who will come and perform at the tiny platform. The Tatseo Sisters performed last week, and Alobo Naga might perform in the coming few weeks. Karen, who takes special care of the food cooked in the kitchen, sources her ingredients all the way from Nagaland. The smoked meats, the yam leaves, the axhone, the dry mushrooms, the Naga spring onions and the raja mirchi — all come to the capital on a train. And, I guess, that's what makes Dzükou's food so authentic and straight out of the lush valley in Nagaland. And oh, did we tell you that Naga food does not use any oil to cook us this storm?